SING pleasantly surprises me. This is one of those cases in which the trailers and previews don’t really quite do the movie justice but that’s a good thing because you are in for a treat. 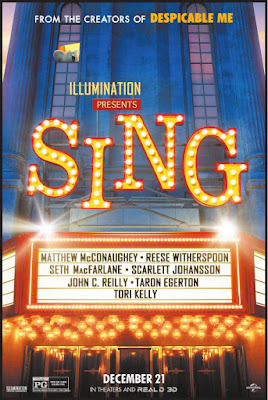 SING is joyous, wonderful and affirming. A must-see for the entire family. Written and co-directed by Garth Jennings (“Son of Rambow”), the story is essentially about a dapper Koala named Buster Moon, voiced by Oscar winner Matthew McConaughey, who has one final chance to restore his once grand theater that has fallen on hard times to its former glory by producing a singing competition. Set in a world like ours but entirely inhabited by animals, everyone around Buster thinks he’s delusional, that the theater is no longer worth saving, that it’s time for him to let go and move on. But Buster persists and so five lead contestants emerge for this competition. A smooth con-artist jazz mouse named Mike (Seth MacFarlane), a shy elephant with an incredible singing voice and a stage fright, Meena (Tori Kelly), a pig mother named Rosita (Reese Witherspoon) raising 25 piglets, a young gangster gorilla named Johnny (Taron Egerton) who doesn’t want to be in the family business anymore, and a punk rock girl named Ash (Scarlett Johansson) who goes solo after her arrogant boyfriend chooses another partner. The trailers and previews only give you the impression that this is just “The Voice” or “America’s Got Talents” with talking animals. And that’s not a fair assessment because when you see the film, you’ll realize that there’s more to it and I think much of that credit goes to writer/director Garth Jennings who manages to create such complex characters and an even bigger complex unifying dilemma. They’re so well-written, you end up caring so much about what happens to them. Many of you will come to watch this movie just for the songs and trust me when I say, you will not get disappointed. 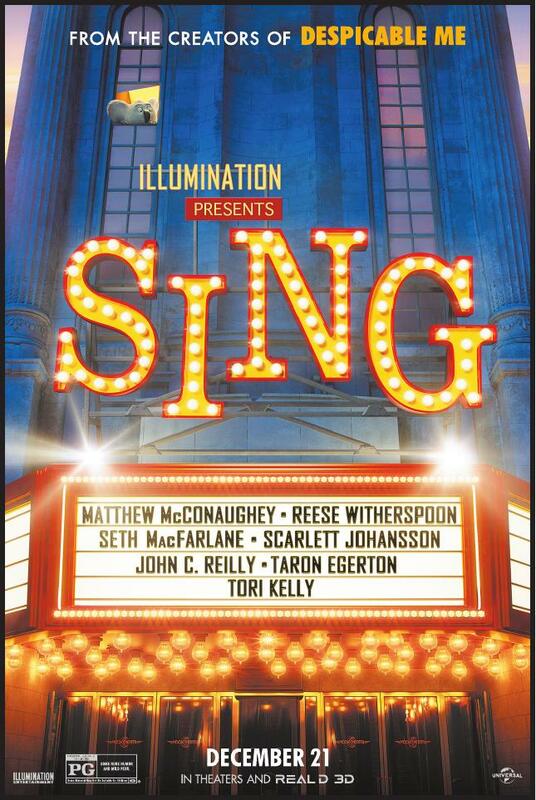 SING features more than 65 hit songs, many of which are your favorite and their renditions range from entertaining to mind-blowing especially with Tori Kelly’s version of Leonard Cohen’s timeless classic, “Hallelujah.” Earlier this year, Disney had their own talking animal movie, “Zootopia” which I thought was very well-made but their theme was a bit too heavy for young viewers. The story and the characters in SING have depth, and it’s about getting back up after you’ve already been knocked down. This is one of those films that could give young viewers a strong sense of hope and belief in their future no matter how bleak it may seem at the moment. It’s got heart, it’s got humor, it’s got passion, it’s got a finale that creates something so grand out of messy rubbles. No offense to Gru and his minions, but this has got to be my #1 favorite Illumination’s animated movie ever! There needs to be more movies like SING.